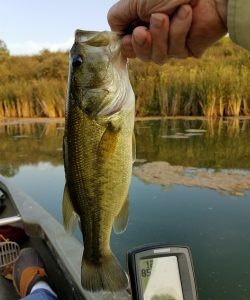 A couple more submissions and an interesting bonus bass pic from West Central Illinois as the dog days are back in full swing in that neck of the woods. Angler Comments: It isn’t much but at least something. Caught four bass. This was the biggest. The other three were just under a pound. Fished from kayaks from 5:20 to 7:45pm. Angler Comments: Had a pretty good morning, 3-5, 3-9 and the last one was this 3-15. Thanks guys and pretty cool on the bass breakfast pic. 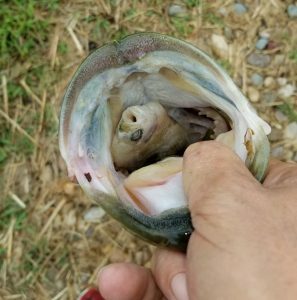 Always worth a peek into the mouth of the catch, especially those fat bellied bass for a clue as to what’s on the menu. I frequently see crawdad antennae as well and have witnessed bass coughing up a batch of tiny bluegill or minnows on the way to the boat. 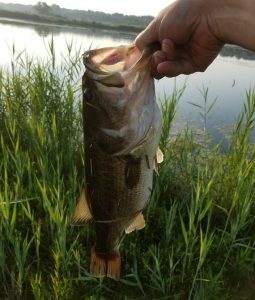 Tales abound of stuff showing up in the livewell and pics of frogs, snakes, birds or even rodents as bass meals pop up from time to time. Never personally seen any of that last bunch of forage but goes to show how these predators roll. And as tough as the bite can be sometimes it never fails to amaze at the gluttony exhibited on occasion by a bass with a full belly opting for yet another bite. Good stuff.